Jesus is faithful. He will carry our burdens. We simply need to come to Him and hand our struggles over to Him. 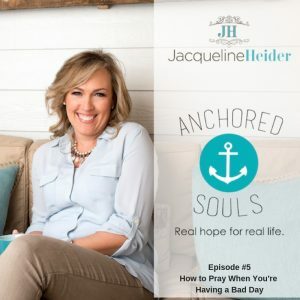 I hope you enjoy today’s podcast and grab thislittle freebie over at Anchored Souls that can help you apply the prayer method I talk about to your daily life. This simple, yet effective tool has helped calm my anxious heart by refocusing my thoughts and attention onto the Lord. I pray it does the same for you. If you are not familiar with podcasting, simply click on the “play” button above to listen from the blog. If you’d like to listen “on the go,” you can click here to access the podcast from iTunes. Be sure and subscribe to the podcast on iTunes so you don’t miss an episode.